Yes, I know it is tempting to decorate our front porches with bales of hay and winter squash, or those oddly shaped beautiful pumpkins in oranges, golds and blue. It is also tempting to scatter those decorative winter squash on our fireplace mantels and “Horns Of Plenty” this time of year, but I’m here to tell you…. Those pumpkins and squash are meant for eating! Well…. Some of them. Pumpkin! Pumpkin is a perfect example of a “winter-squash”. Not just any kind of pumpkin but one that is more flavorful, high in nutrients, bright in color, and distinctly flavorful based on their own unique creation. These types of pumpkin include Peanut Pumpkin, Lumina, Cinderella, and Pie-Pumpkin… all of which are in season and plentiful this time of year. So say you aren’t into the whole pumpkin idea and want to use something else? Other varieties of winter squash you could substitute with are Butternut, Acorn, or even Spaghetti Squash. Canned pumpkin (not “pumpkin pie filling”) is also a good substitute. Now in my initial “recipe testing", I had leftover roasted chicken that I wanted to use up, so went ahead and added that to the lasagna for a protein factor. Italian Sausage would also be great paired with everything. Have fun with this… it’s fall and this is a perfect seasonal dish. If you aren’t sure the pumpkin/winter squash you chose (don't use Halloween pumpkins) is the most flavorful… google it… or use canned pumpkin. If roasting your pumpkin: Preheat the oven to 425 degrees. Wash and slice your whole pumpkin in half. Scoop out the seeds and pulp, reserving the seeds for roasting if desired. Coat the pumpkin inside and out with oil. Place the pumpkin halves cut side down and roast in the oven for 30-35 minutes or until fragrant and tender. Remove from the oven and let cool enough to handle. In a cast iron skillet or skillet of choice, heat a bit of your olive oil. In batches brown your sliced mushrooms, seasoning to taste with Cook’s Line Seasoning or salt and black pepper. Remove to a separate plate. Add a little more oil along with the minced garlic. Add the rough chopped fresh kale and cook long enough to wilt the kale. Cook in batches if needed. Season again to taste with the Cook’s Line seasoning. Set aside. To make your béchamel sauce, scoop out the roasted pumpkin… at least 2 cups full. In a large saucepan melt the butter and add the flour. Cook the roux to a nice golden color. Slowly pour in the heated milk whisking briskly. Add the Cornbread Dressing Blend (substitute with ground sage and nutmeg to taste). Cook the béchamel until it thickens and add the roasted pumpkin/canned pumpkin/or mashed winter squash. Taste for seasoning and adjust if needed. 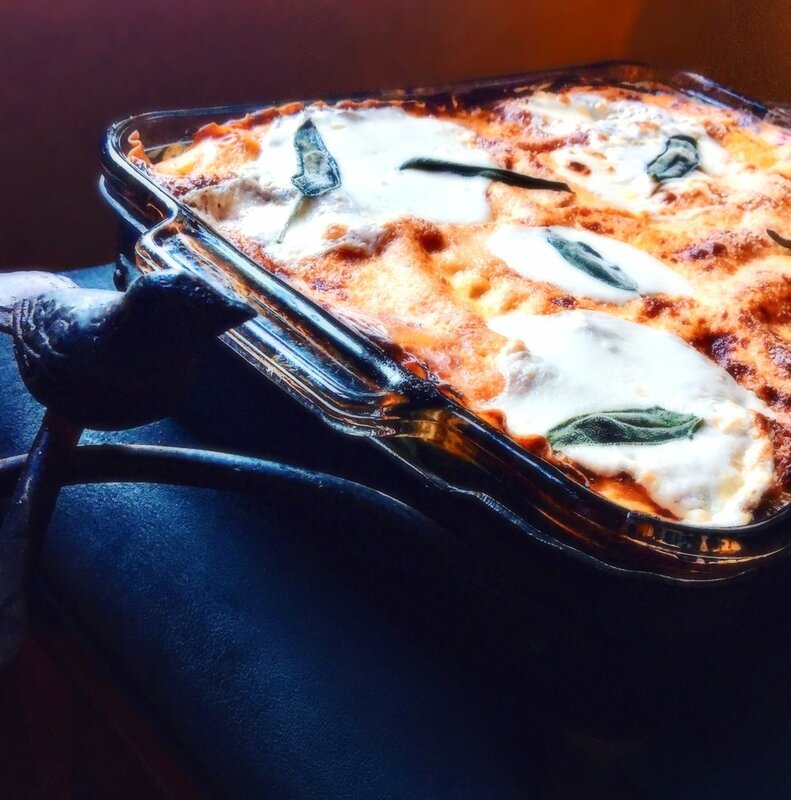 Start building your lasagna: In a 9x13 pan add one cup of the pumpkin béchamel sauce to the bottom of the pan. Spread it out evenly. Next add a single layer of lasagna path lengthways. Sprinkle in a thin layer of shredded mozzarella. Top that with a combination of the sautéed mushrooms and kale. Add 1 cup of béchamel sauce and spread out evenly with a metal spatula. Add another layer of lasagna pasta and repeat the process. Your goal is to end with a layer of pasta and layer of béchamel sauce, so eyeball that the best you can. Heat your oven to 375 degrees. Sprinkle the top of your lasagna with grated parmesan cheese. Place in the oven and bake for 45 minutes. Remove from the oven and add sliced mozzarella or extra shredded mozzarella you have left over. Garnish with whole sage leaves and place back into the oven an additional 10 minutes. Remove from the oven and let the lasagna rest for ten minutes. Slice and serve.